Breeding Stock: Has Supply and Demand Stabilized? With the sterling rebound of the yearling market, as exhibited by gains across the board in yearling sales statistics this year, one would naturally expect the breeding stock sales to rebound similarly. However, the broodmare and weanling markets have been considerably slower to regain their footing than has the yearling market. As shown in our last blog post, the yearling market has been steadily gaining momentum since its drop in 2009. 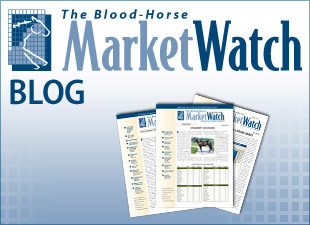 But averages for broodmares (including broodmare prospects) and weanlings at Keeneland November continued to decline through 2010 before improving in 2011, when there were two large dispersals of high-quality stock—Edward P. Evans and Palides Investments—that accounted for 35% of the total gross and increased the broodmare average by 26%. 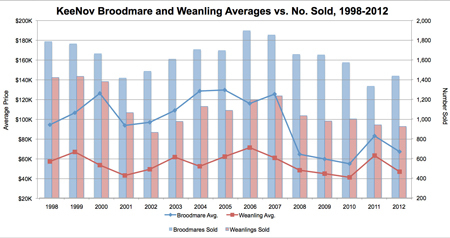 Even more compelling, from 2006-12 there was a -42% decline in broodmare average at Keeneland November, the exact difference in mares bred over the same time period. Weanlings experienced a similar reduction, as their average fell -34% from 2006-12, while the foal crop was down -38%. These figures seem to indicate that the supply and demand balance has steadied. 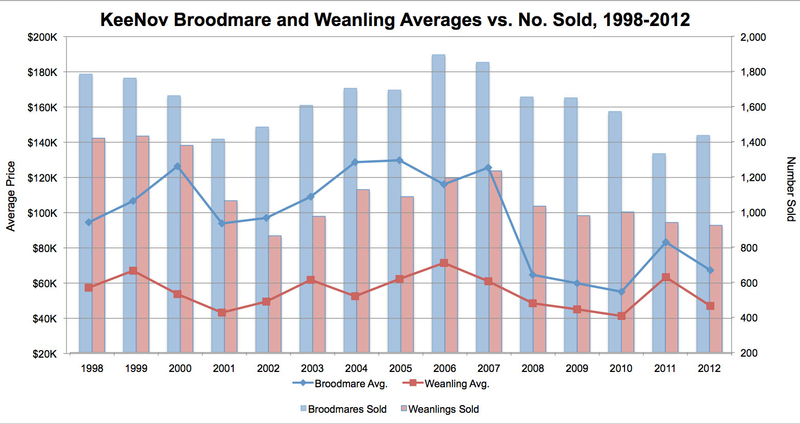 In fact, in 2012 the ratio of mares bred to Keeneland November broodmare average equaled the ratio seen in 2006. In other words, as demand has slowly begun to increase while supply has continued to decrease (the number of mares bred in 2013 was 34,174, down -3.4% from 2012), there is no longer an apparent surplus of broodmares or weanlings. This scenario may cause a significant increase in value for the stock being offered at the 2013 Keeneland November sale.